This is the one we’ve all been waiting for. Weakling is the most essential band in US black metal, the band that created a new template for all the post-Norwegian Second Wave artists. They existed for less than two years (1998-1999) and their only album came out after their demise (Dead As Dreams, from 2000). If you don’t have it stop reading this and get it now. As Aquarius Records writes,”It’s a suffocating soundscape of riffing and drone. Subterranean satanic art rock that equals metal. Nihilistic, depressive and never ending… Ghastly, anguished vocals and bloodchilling keyboards combine with dual trebly buzzsaw guitars and inhuman trance inducing drumming to create an atmosphere of utter grinding grimness… And, like the best music, Weakling also transcends genre. In some ways, Dead as Dreams possesses elements that can be considered akin to the avant garde, experimental creations of Swans, Skullflower, Steve Reich, or even Yoko Ono. Imagine an extensive, utterly mesmerizing Hermann Nitsch piece, composed for black metal band.” Hundreds of black metal bands have used their template but they have never been equalled. Weakling leader John Gossard rose again in 2010 with Dispirit and the free release Rehearsal at Oboroten, and then 2012′s 111112, churning the massive power of Weakling into more experimental, more improvisational, fully orchestrated material, as well as digging deeper into elements of psychedelia, drone, and dissonance. Their live shows are a wonder to behold. The Blackened Music Series is proud to invite you to these two shows, which will feature completely different set lists. These nights are made possible by Sange Valah Productions. Friday’s show features Bay Area black metal band Vorde (members of Fell Voices), apocalyptic electronic death industrial from Theologian, and NYC black metal band Anicon (members of Krallice). 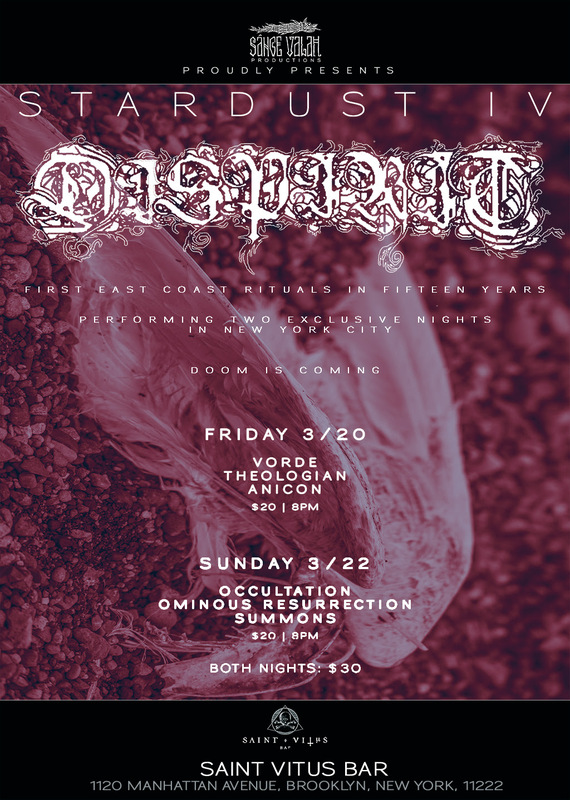 Sunday’s show features Occultation and Ominous Resurrection (members of Negative Plane), and Summons (Death/noise/industrial from Dispirit’s R. Jencks). Powered by WordPress v 3.9.27. Page in 0.260 seconds.